Out of Belo Horizonte in Southeast Brazil, guitarist Andre Vasconcelos has a very unique and intensely energetic style. Throughout his career, he has displayed versatility and proficiency performing with or sharing a bill with numerous musical legends such as Miguel Zenón, Vinx (Stevie Wonder, Sting), Seu Jorge, Guinga, Arturo Sandoval, Oz Noy, Keith Carlock, David Binney, Louis Cole (Knower, Quincy Jones), Bernie Worrell (P-Funk), Jefferson Starship and many others. 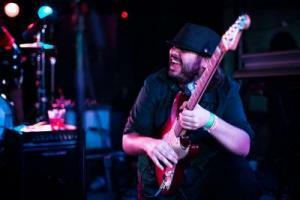 Having graduated with honors from the prestigious Berklee College of Music, Andre is well regarded as one of the most promising guitarists of his generation. During his time at the school he was one of the few students in the college's history to be featured in every Guitar Night; Jazz/Blues, Rock/Pop, Funk/RnB showcases held by Berklee's Guitar Department. Currently residing in Brooklyn, Andre works extensively as a session musician, producer and songwriter for an immense plethora of musical endeavors.